Are lockers available at Luminosity Events? Yes, usually there are lockers available for a deposit fee which is refunded to you once the key is returned. 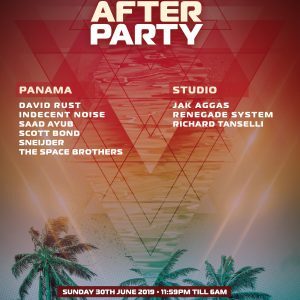 Can I request artists to be booked for Luminosity events? We can not guarantee we will invite the artist(s), but we will consider them for sure, so please do let us know. Can I cancel my ticket order / Can I have my ticket refunded? We are afraid that we ourselves don’t provide option for ticket cancellation & refund. However if you’ve included the cancellation insurance service while ordering your ticket(s) then please feel free to contact the insurance company. Sometimes. Please ask us at info@luminosity-events.nl for a particular event you are interested in. All tickets are on my name / my friend’s name. Is that a problem? Please contact the ticket provider and change the names to reflect each person’s name. I can’t find / I Lost / I Never received my ticket!! What to do? Regarding partnerships, please send us an email. I am below 18. Can I enter at Luminosity events? Some of our events are strictly 18+, other are not and you may go in if accompanied by an 18+ person. Please drop us an email at info@luminosity-events.nl to ask for a certain event you have in mind. VIAGOGO tickets are NOT VALID? Viagogo is not an official partner of Luminosity for ticket sell, hence their tickets are illegal. If you happen to be a subject of fraud in this way, please request refund immediately and buy from out official partner paylogic. Go to the Ticket section in our website, select the event and click on “Buy tickets”. Please also be EXTRA careful whether a ticket you buy on Ticketswap.nl is not also a Viagogo ticket. Line-up phases and ticket phases? What are these? Can I request artists to be booked for LBF? We can not guarantee we will invite the artist(s) as we are full for most of the events to current date, but we will consider them for the future events, so please do let us know. Yes, there are lockers available for a deposit fee which is returned to you once the key is returned. Are we allowed to leave the festival and go back in? Yes. All visitors will receive a wristband which allows access back to the event at any time. Is there any public transport to the venue? Yes, you can use public transport to get to the event venue. The easiest way is to get off the train in Haarlem and catch a bus to Bloemendaal aan Zee (bus stop “Overveen, Strand”). From there you have a 5 min walk. You could also get a train to Zandvoort and bus to Bloemendaal (same bus stop). Keep in mind that last trains are around midnight from Zandvoort to Amsterdam. How do I pay at the event for drinks/food? You buy tokens at a designated desk where you can use credit/debit card or cash and then you use these tokens for food and drinks. We are afraid that group discounts are no longer available. Where do I check which day each of the artists play? The full time-table will be announced in June. 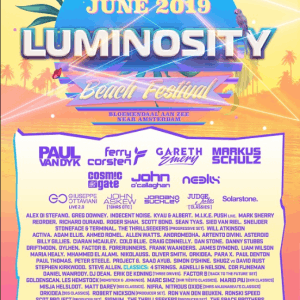 When does Luminosity Beach Festival 2018 start and end? Is the festival in an open area or in a club? The event is held at two venues next to each other, on the beach. The venues are closed, but you can still go out and in to the beach and back. Will there be a disabled toilet? Yes, a special toilet will be available on a spot, available to everyone who needs it. Can you recommend some ho(s)tels closeby Luminosity Beach Festival? We sometimes organize accommodation like we did in 2017, where you can stay with fellow trance family people. For 2018 we don’t have news on this yet, so follow our social media and website, please.